While their business portfolio is varied, their passion is with their breeding program and the quest to advance the quality of the alpaca breed. After admiring for years the virtues of superfine merino fleece, they have selectively adopted a focus on a specific range of fleece characteristics to introduce into the fleece of their alpaca herd. Their participation in the fashion industry through Alpaca Classica has taught them the importance of fineness of micron as the first priority. Chris and Adrienne are proud to boast their recent achievement of having provided the finest fleece sample ever tested by Australian Alpaca Fibre Testing (AAFT) in December, 2007. A 12 month old male named Ambersun Echo Beach tested at an ultrafine 13.9 microns, significantly finer than the Fibre Testing company's previous record of 14.2 microns. In 2007, the average micron of the Ambersun herd was 22.5 micron, and over 37 % of animals were classified as producing fleeces that were tested as superfine or ultrafine (below 20 microns). Within the Ambersun herd this demonstrates a fining of average fleece for the last three years, with the average in 2006 being 22.6 micron with 35.2 % of fleeces tested under 20 microns, and in 2005 the average micron was 23.3, with 29.4 % of the herd below 20 micron. The second fleece criteria of high priority in the Ambersun breeding program is high fibre alignment, achieved through the bundling of staples of fibres with highly defined crimp. 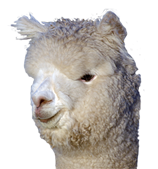 Chris and Adrienne seek a fibre type which could be defined as crushproof, in the show ring, which Ambersun Alpacas utilises as one of its main marketing tools. In a history of 12 years of showing alpacas owned partially or fully by Chris and Adrienne, they have won over 600 broad ribbons (Champion or Reserve Champion) including 66 Supreme Championships. In 2007 they reached a milestone of winning over 100 broad ribbons in a single year. To achieve this record of Championships requires a major investment of time and energy. They prepare and exhibit a team of alpacas at 10 to 12 shows every year. Their show program includes the Australian National Show, Sydney Royal, Melbourne Royal, Adelaide Royal, the Sheep and Wool Shows at Bendigo and Ballarat, and a number of smaller shows in South Australia.